My Slicethepie Review – Is it Legit Or A Scam? So there have been a number of reviews relating to Slicethepie and whether or not you can make money from it. Is Slicethepie legit or is it just another online scam? Well, lets cut-to-the-chase and I’ll tell you up front – that it is in fact a legit way of making money online. Whoooa, really? Who would have thought that you could listen to music and get paid for giving your opinion. That’s a pretty cool way of making money online if you ask me and can pay a similar amount as most popular survey sites like Opinion Outpost, only difference is you get paid for every opinion you give. Here’s another good way to make money. Oh, and you don’t have to worry about not getting paid because you don’t qualify for a survey, or even waiting around to even get sent a survey – nope you can literally start earning money in the next few minutes. But I have to stress that this is a short way to earn a couple of bucks, and a more sustainable way to make money online is to start your own WordPress blog like I show you here and build a niche website like I show you here. Can you really make money with Slice the pie? I know … seems too good to be true – right? Because whilst you can make money with Slicethepie (like I’ll show you in a minute) … I’m pretty sure you’re gonna be a little disappointed doing it the conventional way. I’ll show you how I do it, and what the number 1540 has to do with me making it. 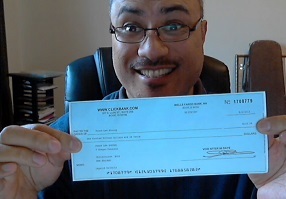 But before I get into that, let me show you some proof of income with Slicethepie. I took Slicethepie for a test drive to see if they actually paid out and guess what? With the minimum payout being $10 (currently), I waited until I had reached the threshold and then asked for payment. A few days later – boom. Thanks Slicethepie. Whilst you might not get rich with Slicethepie, it’s probably one of the easiest ways to make money online. Eleven bucks is nothing to get too excited about, but hey, it’s better than a slap in the face with a wet fish. Anyway, I just wanted to prove to myself more than anyone else that Slicethepie actually paid out. Because it ain’t no use in clocking up the funds only to find out that they don’t pay you. So there you go, they do pay out. And I have to say, if you’ve got nothing better to do then, this is a fun way to make a buck or two. If you want to make some REAL money, then you have to check out this program. So here are a few more payments I got from Slicethepie. What does the number 1540 has to do with my decision. The website began in 2007 and it allows unknown bands or musicians to get their music reviewed and rated by people, which could eventually lead to the artists being put forward for A&R opportunities or radio placement. Most of the reviews go back to the artists to help them evaluate how their music is being perceived by music fans, which can provide some valuable insight into their music. As a reviewer, you are offered payment for your reviews. I believe that the artists pay Slicethepie a fee to get feedback and a wider listening audience for their music. Ever heard of the phrase – starving artists? This was typically a term coined for the art industry, where a lot of artists lived on next to nothing in pursuit of becoming a famous artist. But it can also apply to the music industry, given music can be thought of as art also, and there are a lot of starving musicians out there too. So something to keep in mind when you provide reviews on the songs. As a reviewer/rater, you are given a selection of random songs by unknown artists to listen to. The time that you spend listening to and reviewing and rating the artists is referred to as – session time. They provide a timer of 90 seconds before you can submit a review to ensure the artists get fair air time. In my experience, you’ll need at least 90 seconds in order to make a fair assessment anyway. 1) Provide a texted based review of the song where you might include your thoughts on the vocals, the instruments, the arrangement, the lyrics , and the melody. The more details you include in your reviews, the higher ranking you’ll get. Higher rankings lead to more earnings per review. And I’ll get into how you can increase your earnings and rank in a minute. Most review payments start off at $0.02 per review, having said that my initial earnings started at $0.05, then went up to $0.07 most likely because I added more detail in my second review. They give you clues as to how you could increase your earning potential via these bonus popup messages, so just keep that in mind. As I mentioned eariler the more informative you are in your reviews the more money Slicethepie seems to payout. Therefore it only makes sense to figure out what the difference is between a good review and a bad review. And try and capitalize on each and every review. With each review paying anywhere between $0.02 and $0.20, I know what payout I’d rather have for the same amount of time and effort. So maximizing your efforts can help you to become a lot more profitable. So with that being said, here’s how you can maximize your earning potential. As you can imagine, it would be near impossible for Slicethepie to calculate out each individual review as they come in manually, therefore they’d have some sort of mathematics algorithm that does the calculation on the fly for them. With that being the case there will be certain keyword phrases that they would be looking for that together help them calculate out a score. From the information they have provided in their message boxes and from what I have gather from other users, there are a few key things you need to mention in order to start getting a better score. Of which will help the artist get a better understanding of how people might perceive their music, but also areas that they might need to address. Vocals : What sort of vocals does the song have? Is it a duet, A female singer, A male singer. Are there any stand out features about the vocalist you’d note. If yes, then what would it be. Do you think that the vocalist is similar to a well-known or popular artist in the marketplace. Do you think the vocalist has a commercial voice. Maybe the vocalist has an unusual sound, in which case you could comment on it too. Lyrics: While we’re on the topic of vocals, the lyrics play an important part in any song, as they help to convey the songwriter intention of the song. Some songs are deep and meaningful and some songs are playful and silly. For example : “I believe I can fly”, by R. Kelly might have a deep and meaningful personal growth story. And conversely a song like “I’m a barbe girl”, by Aqua is a more playful light heart song. So you can say that in your review. (i.e.) The lyrics is light hearted, playful and made me happy when listening to it. Bass: The bassline in most songs usually holds the rhythm / the song together. So it is an instrument to listen out for in most musical genres, there you should always have something to say about the bassline. As the song goes “it’s all about dat bass, bout dat bass”. Beat: I just about wrote drums, but it’s more than that, it’s more about the beat. The beat is another important part to any song. In fact the bass line and beat go hand in hand. Therefore, mention the beat in the song as the two (the beat and the bassline) create the rhythm or the flow of the song and helps to provide the musical direction. Use Descriptive Phrases: You can basically say the same or similar thing again if the song lends itself to it, but change the words you use. A good thesaurus will go a long way to helping you find the right synonyms to select for each review. Whilst, you could cut and paste your answers, it is better to give meaningful / honest answers as it really does help the artists out. And lets face it, part of this process is to make money, but it is also to help the artists. Musical Effects : You can also talk about the musical effects if there are any that standout. A lot of modern music produced these days don’t use “real” musical instruments. (i.e.) It’s synthesized music. Nothing wrong with synthesized music if that’s what you like, but me personally, I like “real” instruments like a drum kit, an electric bass, a guitar and keyboard. So this is something you could discuss in your review also. For example: It would be easy to mention that fact that the song uses real instruments and this is something that you really enjoyed about the song. Or if they used a synthesizer then you could mention that although the song used synthesized instruments, it still sounded full and flowed well. What If You Don’t Know Anything About Music? The good thing about music is that you don’t necessarily have to know how it’s been put together, you just have to know how it makes you feel. Music is perceived and whether you know or don’t know anything about music is irrelevant. A lot of music is purchased everyday by folks who don’t know a thing about it, but only how it make them feel. This is what is called the commercial marketplace which in a lot of cases is the market these artists are appealing to. So your opinion could make a difference. 2) Rate the song based on a scale of 1 to 10, where 1 is low and 10 is high. So once the song has been playing for at least 90 seconds, you will be given access to rate the artist. Rating is a pretty easy process, it just requires that you move a slider bar back or forward to select what you feel is the most applicable rating for that artist. Once you’ve completed those two things, hit the submit button and you’ll get paid for the session. As I mentioned earlier, payments are accumulated until you reach a minimum threshold of $10. Once this happens you’ll be allowed to withdrawal the funds into your paypal account. How do you make money with Slicethepie? So the the idea here is to create as many high quality reviews as you can so as to make as much money as you can. Pretty simple huh. I actually started making money in the first 5 minutes of joining. $0.05 whole cents – wow – lol. Okay – so this may not be a big deal for most, but it could be for folks who have never made a cent online. There is another way to make money, which may be a little more lucrative and that is by referring other people to join Slicethepie and have them do the same thing. You’ll get a piece-of-the-pie from their reviews too. Don’t worry it won’t affect their earning potential in anyway – they will still be ranked according to the quality of their reviews. So if you think about it – it can add up – but, I gotta say, it’s a lot of work for such small returns. I really like the fact that you can actually make money from listening and evaluating peoples music. You also get to hear a lot of music that hasn’t hit the mainstream music scene or to unknown bands that might become big. Who knows – one of your reviews might have been the final one that helped the artists sign a record deal. Whilst the concept is pretty cool for the bands and recording scouts, you (as the reviewer) have to do a lot of work for little return. If you have a talent for writing good reviews at around 600 to a thousand words per review, then there are plenty of webmasters who are looking for talent writers to create content for their websites. You can make anywhere between $5 – $25 per article (as writer) – depending on the length and quality of the review. So there’s definitely a big difference between earning $0.22 per review and $25 per review – right? Learn how to earn $100 a day writing articles here. Is Slicethepie worth the effort? Programs like Slicethepie is never going make you much money online – but they can be fun … and in my opinion should only be viewed in the context that they were intended. In my opinion it is a pretty cool way of listening to music and making money at the same time, however as discussed earlier, you only start to make the big bucks (i.e. 20 something cents – whoooa) if you’re prepared to put in the effort and create in-depth lengthy reviews and get a number of referrals. And if you’re willing to do that, and you’re reviews are pretty good, then there are definitely better ways of earning money than with Slicethepie. For example, if you can write good articles, the same way you would for Slicethepie then you can potentially earning 100 more. Want to learn how I make money online then join me here. Thank you posting about this website! I spend most of my days listening to and looking for new music so this would be perfect for me. My only concern with this article is that I could not find a date on it and so I don’t know how recent your review is or how relevant to March 2015. Thank you for being a guinea pig for us! I did write the article a little while ago, but I am happy to say that it is still relevant 25th March 2015. Thanks for the info. Got a quick question for you…how did you try and get paid for it when the link says it’s not up and running yet? Just curious. Are there any other sites like this that’ll pay you to review music? Slicethepie is currently shut down due to maintenance and I would rather start somewhere else while I wait. Nice review, helped me alot. So basically when it says the review is not detailed enough after doing all the steps to breakdown what should i do? Should i just do a different review instead of completing this one? Also i made a good 50 cents in like 20 minutes. Is that the normal rate? Slicethepie usually offers clues as to what you should include in your review. So I just update the current review making sure that I give an appropriate answer to the clues they sent me. how do I change the genres that I review? I remember saying that I don’t like rap but it keeps telling me to review that type of music. There is no way to go back and change the genres of the music. Seems like a fun way to make money! But for some reason, I can’t register… I’m sure it’s really simple to fix but I’m getting REALLY frustrated with this! I can fill in each box without problem, but when I get to the birthday box, it stops working. First it asks me to put in my birth month, then day, then year. I type the month, then hit tab to the next box. But then my answer disappears. Filling in both day and year works, but I can’t fill in the month, so when I try to sign up, it tells me I didn’t fill in the box. Help? I WANT TO REVIEW MUSIC, FOR MONEY. Just complete the one you’re on. Remember the checking mechanism is just an algorithm, which basically means they are expecting certain keyword phrases to be included in your review as mentioned above. This review is great, exactly the info I was looking for. Thanks! Now I can feel at least minimally productive while wasting time online. Its seems like good.i also like to say my opinion.i want to try it.maybe there is a chance for everyone.